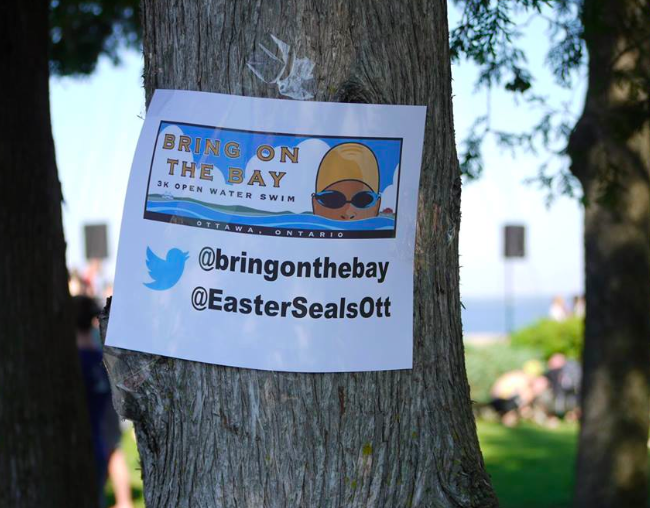 Swimmer Kim Lumsdon swims Lake Ontario...again. In an attempt to become the oldest person to swim across Lake Ontario, Kim Lumsdon started her swim yesterday. As of last night, Kim's swim progress could be tracked via Spot, check it out! Wow, now that was fun!!! 11 sharks swam the 3km race (the beaver hanging out near the shoreline stayed behind! ), and a big congrats is in order for all! 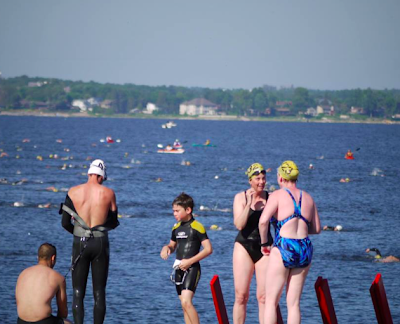 The weather was wonderful, the water was warm, and the event was amazingly well-organized. And we swam really, really well! 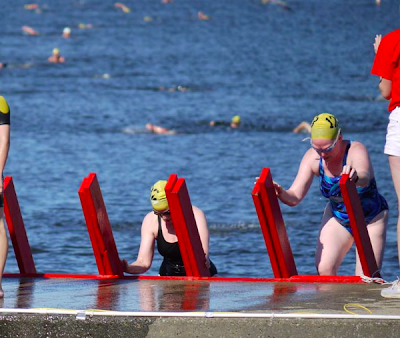 Special recognition goes out to the newer swimmers in the club who had never done an open water race before, it takes guts to jump in there and give it your all, way to go! 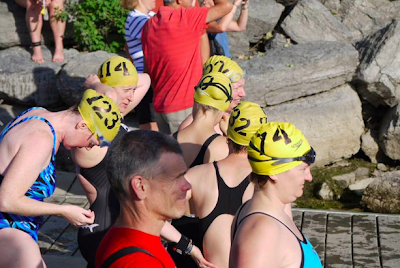 Next year, let's plan ahead and do some training together for the event - open water is new to most of us, and there's lots of room to learn new skills and improve on your existing ones. And, have a great time training with your fellow team mates! 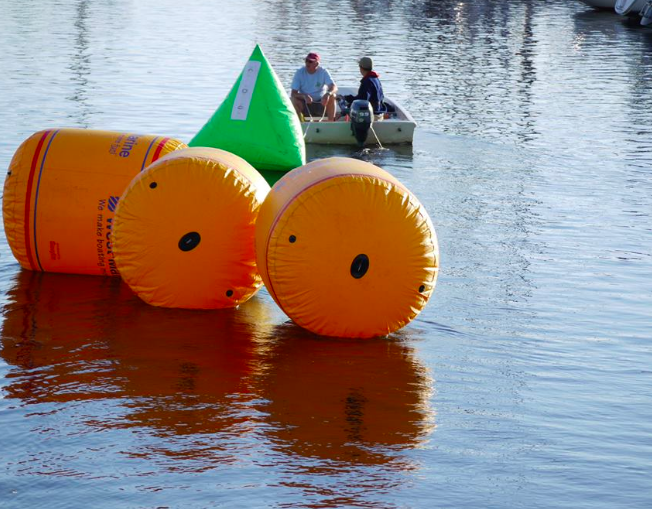 Buoys being set up as course sighting points. Wave 1 (men) set off, Wave 2 (ladies) waiting on the dock. Heading up the red ladder finish line. Those ladies look familiar? and neither knew until they were on the dock! Million Metre Challenge - sign up! 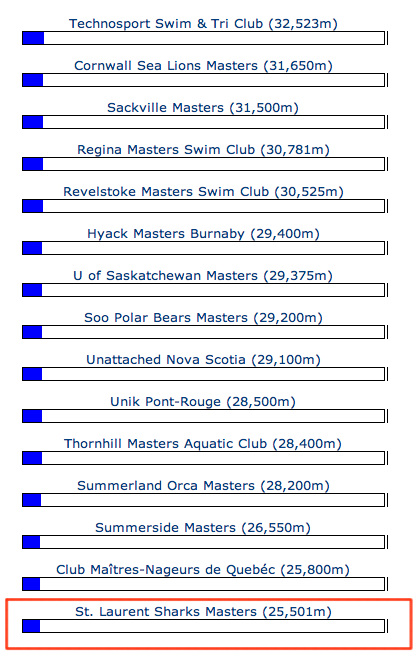 The Million Metre Challenge is a Masters Swimming Canada program designed to promote swimming for health and fitness. The program encourages regular participation through tracking of cumulative distance swum and recognition as the swimmer reaches various milestones. Congrats to Candace, who surpassed her 100,000m milestone this week! 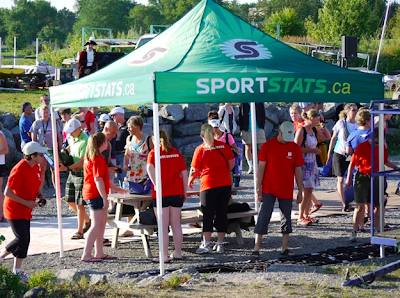 She'll get her 100,000m milestone swim cap courtesy of Masters Swimming Canada. Only 900,000 more metres to go, you can do it! 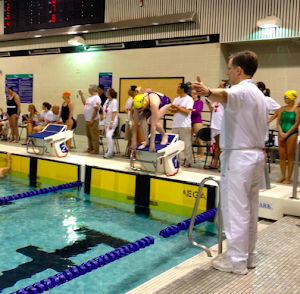 2014 Canadian Masters Swimming Championships being held in Windsor, ON! Next year's nationals would be quite a trek! 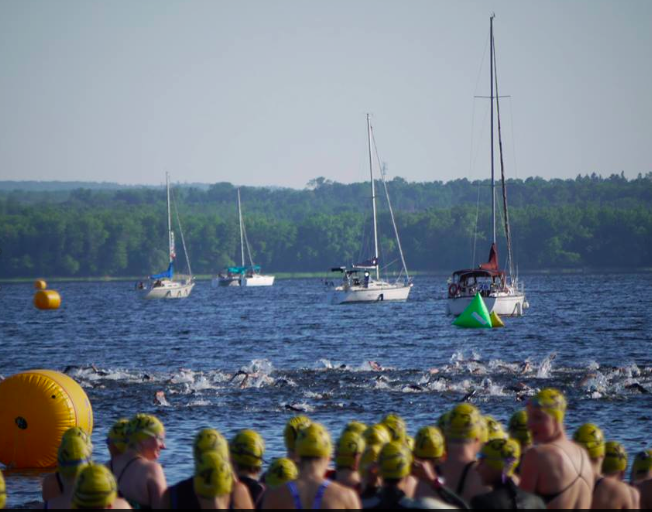 No registration = no swim!!! Please remember, drop-ins are permitted only by prior arrangement with the Complex's management, at a cost $9.75 per session. For anyone interested, the 2013 USA Nationals start June 25th at 9am. Take a look at the psych sheets. Scary fast. Meech Lake 2k - race report from Laura! 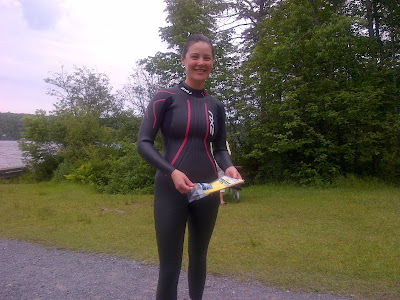 The Technosport Meech Lake 2km Race took place on Sunday, here's a race report from Laura. Congrats on the great swim time! The water was calm and not cold in my opinion. The turn out was decent but not overwhelming. I went out fast but then suddenly got tired and a bit panicky. I almost gave up, but then calmed myself down with a few breaths and a few breast strokes, then reminded myself that its just a swim and I do this all the time. 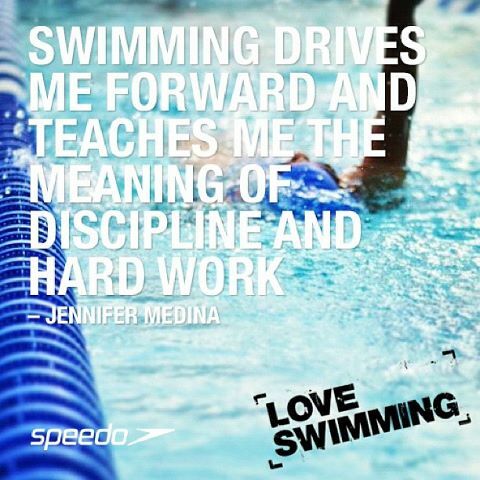 Just go with the flow and enjoy the swim one stroke at a time. In the end, I did fine. My friend clocked my time at 37:47. I think I was the fourth woman out but remains to be confirmed on the stats. I'm just happy that I did it. I am looking forward to a straight line course, not going in circles. Sighting remains a bit of a challenge and I find it a bit disorienting to swim in open water at this time. Nonetheless I like being in the water and all in all, a good experience. 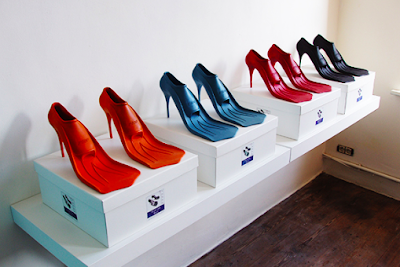 PS - there is no sophisticated way to get in or out of a wetsuit. fact. Coach Mike is on holidays for a few days, the next two practices will be with Nick!